Male 31 years old, skied since I was 12, raced in jr high and high school; skied 4 days a week in high school. 5'-10" 175 lbs. Now that the basics are out of the way, the long winded stuff. I taught my wife(girlfriend at the time) to ski about 7 years ago. Shortly after, we bought a house, got married...and just kinda got out of it. Fast forward to this year. We went up to Stratton, VT for two days, had a great time, 3 weeks later she has a Pair of K2 Sweet Luvs and Salomon Devine 10 heated boots. Since then, we've made about 3 trips to Mt Snow. My wife is HOOKED and loves skiing as much as I do. It's awesome. I'm currently skiing on a set of 188cm K2 El Caminos.....circa 1998(?). From what I recall at the ski shop I was working at at the time, these were basically the K2 Four, minus the piezoelectric (sp?) damper. Bindings are Salomon 997 Carbons. I really like the ski, but feel it's time to upgrade given how much things have changed in the last 10 or so years. We live in CT, so we usually ski up in Vermont. As you know, conditions can vary. Since my wife is still somewhat new, we've been sticking to mostly blue cruisers. However, I do like to venture into the terrain park, trees, and really open up and crank out some nice GS turns. I don't know how to describe my style. I sometimes keep both skis on the snow, but for the majority of the time, I lift my inside ski up a bit...guess that's an old race habbit. So, I'm looking for advice as to: What skis to look at and: What size to get. The Head Monster78 keeps popping up. I was at a local shop that had a pair, but only in 165. I was thinking that would be a bit short. I know I'll drop down from the 188's currently, but thought 165 was a bit too much of a drop. I'm open to pretty much any brand, so let the suggestions fly! If you need more info, I'll gladly post it. Thanks in advance, I look forward to the responses! Not much of a gear maven myself, but I am sure the "guys" will chime in soon. If you have not paid the $20 or 25 it costs to be a fulll member and be able to access the gear reviews, it is well worth it. Peter Kelty, has done an amazing job for years, in giving clear concise distillation of the results of ski testing/demoing. Buying at the end of the season will save you a lot and it is his opinion that there are no big advancements/changes in ski design for '08/09. You might want to look for skis that do well with both traditional and modern technique. The icons on the reviews indicate which skis work with both techniques. For the quick version, look at Jim Ratliff's explanation in the "New Skis for Wife" thread in general discussion. I never knew what those icons meant until I read his explanation, Thanks Jim. Thanks midwif! I joined as a full member yesterday. I've been reading quite a few reviews since. Glenn, I won the IM 78's in a 171 cm length. These are the best mid fat/allmountain skis that I have ever owned. They hold great on hardpack, the float nicely in up to a foot of fresh, they have a tight turning radius enabling tight carved turns, and they are wonderful ski in chop and crud, and lastly they are great skis in bumps. I have not owned a mid fat ski for several years. Typically I ski on Slalom carvers most of the time (in up to 6-10 inches of fresh snow) and then I ski on fat powder skis when there is a big dump. I bought a home in Montana this season and I have found that a 75-80mm ski under foot and at a shorter length than my long wide powder skis has been better and more enjoyable in the lighter Montana powder. The dumps are never huge like in Tahoe (where I was regularly skiing) and I really never need a full bore powder ski. The 78's are great and they are the perfect ski. The question as to what ski for you depends a lot on where you will ski most often and what kind of conditions you will be skiing in and what kind of terrain you will be skiing. I personally think it will be hard to find another one ski quiver as good and as versatile as the IM 78. The cold Heat and the Im 82 bot have a GS type feel, bust crud incredibly but are on the stiffer side and therefore are less forgiving in bumps and challenging off piste terrain (if you get back they will wnat to run out from under you). The Watea 84 has less performance on hard snow. Having said all of this, if I lived on the east coast and skied mostly in Vermont on Hardpack, I would own a slalom carver with some all mountain capability. My favorite is the Head Super Shape, a truly great ski. You might look into the Super Shape Magnum (a little wider under foot (70mm vs 66 on the SS), as well as the Dynastar Contact Ltd. The Fischer RX8 Fire is also another wonderful and forgiving all mountain front side carver with a little less top end performance as the previous ones mentioned. I also own a pair of Fischer Progressors and this is a great ski with all mountain capability. At 175 and 180 lengths it feels like a cheater GS ski (a much tighter turn radius that a race GS ski) and at the 170 length it starts to feel like an all mountain slalom carver. As for length, the same ski will take on very different characteristics at different lengths. It really comes down to what you want the ski to excel at in the length that you buy. 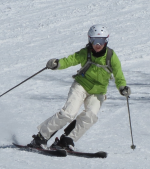 Shorter skis will carve tighter turns, be better in carving and brush carving bumps (but may be harder if you are pivoting in the bumps), will give up some stability at speed, and will challenge your fore aft balance on choppy off piste conditions more. I? hope that helps some. Glenn....and like Jbotti...I ski my carvers, Head Super Shapes 165 length on everyting up to 6-10" of snow and then go to one of my favorite mid fats ever, the Fischer Water 84. This ski actually can be skied in all conditions, quick edge to edge, floats, carves, bumps, trees and can be carved on the groomers. Me...I'm 5'81'2, 155 lbs and ski the Watea in a 176 length. I've also had the IM82 and find the Watea much more versatile. If you get a chance, demo it in some Vermont spring snow. Try the 176 length and have them move the binding forward 1centimeter before demoing. At our size and weight, I think it makes it easier to get maximum performance from skiing this ski from a centered stance. I find these 2 skis set up in this manner give me maximum coverage for most snow conditions. Thank you very much! You both posted some excellent information! I've been reading that some twin tips are decent all mountain skis. Any thoughts on that? I'd really like to get out and demo some of your suggestions. I guess I have to take into consideration that it is icy here at times in the north east and I will need a ski that can handle the hardpack and ice. Glenn...if you're talking about the super fats with twin tips, I believe they are great for the purpose for which they were designed, big snow. The twin tips allow for easier maneuverability in deep snow. Less resistance in brush turns or swiveling the tails. Other twin tips designed for terrain park use have constrution (flex patterns) more suitable for tricks, air time...fun park stuff. These skis also ski shorter because of their turned up tails. I believe you should stick with a non- twin tip mid fat or fat ski that has the design features and construction that can handle firm or hard snow and powder. Something stable at speed and big turns as well as light enough and solid on edge enough for quick along the? edge turns. Well...unless you're planning to work on your toe grabs, 360's, and big air moves. After doing a little more research yesterday, I see you're right on the money. I really do need to focus on more of an all mountain ski that can do well in a variety of northeast conditions. Seems like the IM 78 is going to be my baseline; I just need to look at each brands equivalent of that ski. do try the Fischer line and let us know your opinion after your rides and comparisions. Still snow on the ground near you? ?...I heard Stowe had snow today. I went to a new ski shop with my wife yesterday. They had a good selection, but the sales guy just wasn't that into it. He showed me a few skis and was pretty brief. Oh well. Looks like we'll take a ride to the place we purchases my wife's skis from. The prices seemed a bit hight too. They wanted $839 for a pair of K2 Apache Recons with m12 bindings. I've seen a few of the shops on the Barking Bear forums blowing them out for prices in $500's. Even with shipping, I'd come out way ahead of the game. I live in Connecticut...we haven't seen snow for well over a month down here. However, Mt. Snow got 8" of snow Friday. We can make it up to Mt. Snow in about 2 hours and 15 minutes. I was laughing to myself this weekend. I've seen landscaping crews out doing spring clean up and spreading mulch. You go 2 hours north, and they have about 2' of snow on the ground. AND....shop for deals on line.....check with Dawg on Epic....Ron has good connnections there. Hope you get more turns before the season snows turn to tulips! Dawg has a special on the IM78 with bindings. I just PM'd him. I'm itching to pull the trigger BADLY. But part of me still wants to test them out first. I guess it all depends on how many he has in stock. If it's a "you snooze you loose" type thing, I may just have to take a calculated risk. Hoping to head up this weekend! There's still a lot of snow in VT, this time of year, it's the warmer temps and rain that really melt down the snow. On the other hand, they've had something like 171" of snow this year at Mt. Snow...which is a lot of snow for them! Glenn...I feel based info you provided that the IM78 is a great choice for you. Any chance you drive a pair this weekend? Looks like Dawg only had one IM 78 left in a 177...and it was a demo unit. I kinda want to stick with new. So now, I'm researching the you know what out of the K2 Apache Recon. Sierra Jim has a really good deal on the 174 length....decisions ....decisions!